Troposcatter is a signal propagation method using the scattering phenomenon in the upper troposphere. 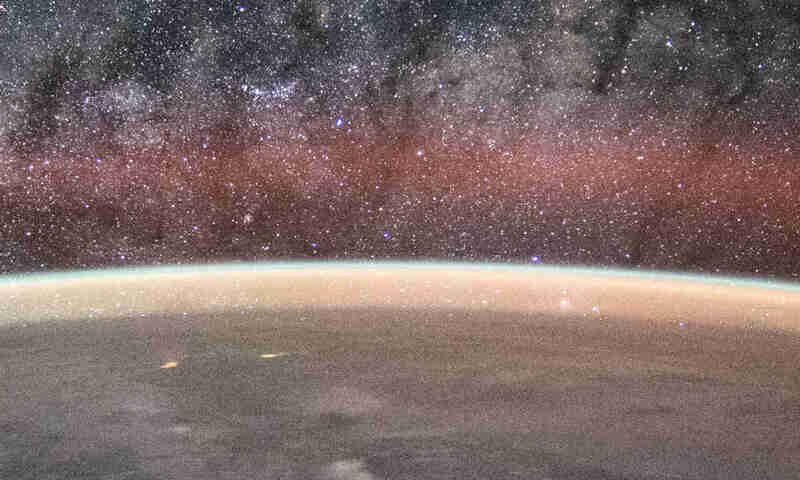 As the signal pass through the upper troposphere, some of the energy is scattered back toward Earth, allowing the receiver station at the correct location to pick up the signal. White Alice is a decommissioned troposcatter network in North America. 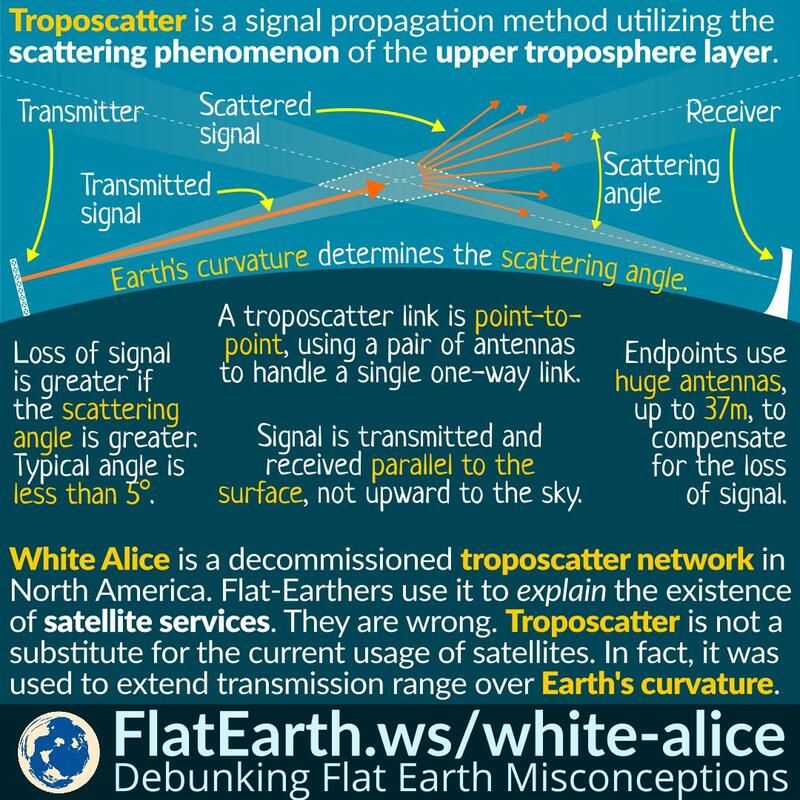 Some flat-Earthers invented the “explanation” that the various satellite-based services we enjoy today are using White Alice. They are wrong. White Alice and other troposcatter networks cannot possibly replace all the services provided by satellites. A satellite in a high enough orbit can remain operational for a very long time because in space there is practically no air resistance. This is a situation that never occurs in our everyday life. A car requires a constant consumption of fuel to keep running, but a satellite can remain in motion without consuming any fuel because there’s practically no force stopping it. 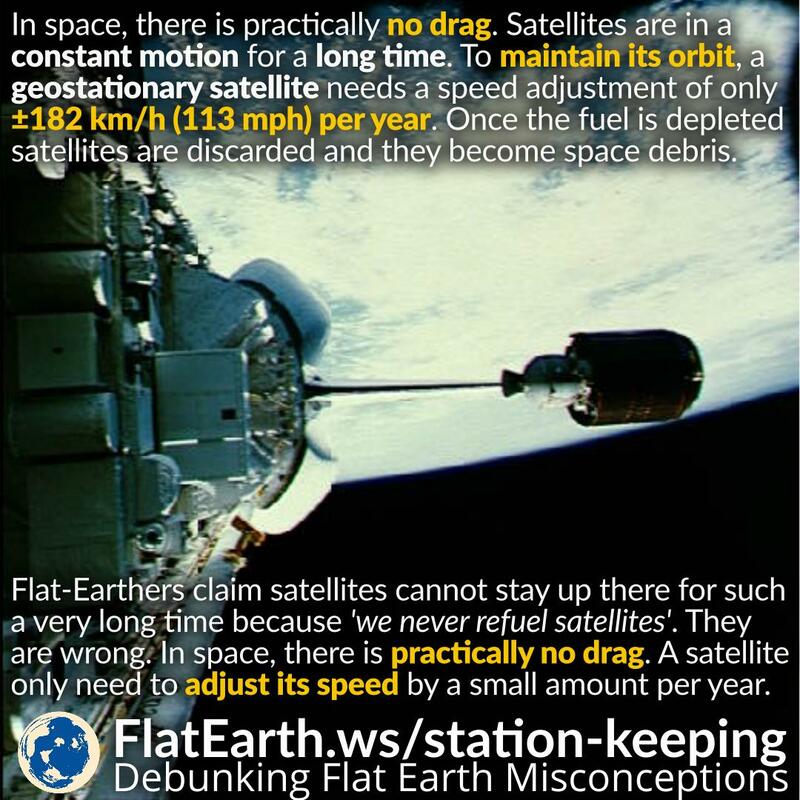 Flat-Earthers claim that satellites cannot stay up there for such a very long time because ‘we never refuel any satellites.’ They are wrong. In space, there is practically no drag, and satellites only need to consume fuel to adjust their speed periodically. They are easier to see the larger and the closer they are. The darker the sky, the easier to see them. Satellites are visible only when they are lit by the sunlight. Because of these conditions, satellites are usually seen a few hours after sunset or a few hours before sunrise. 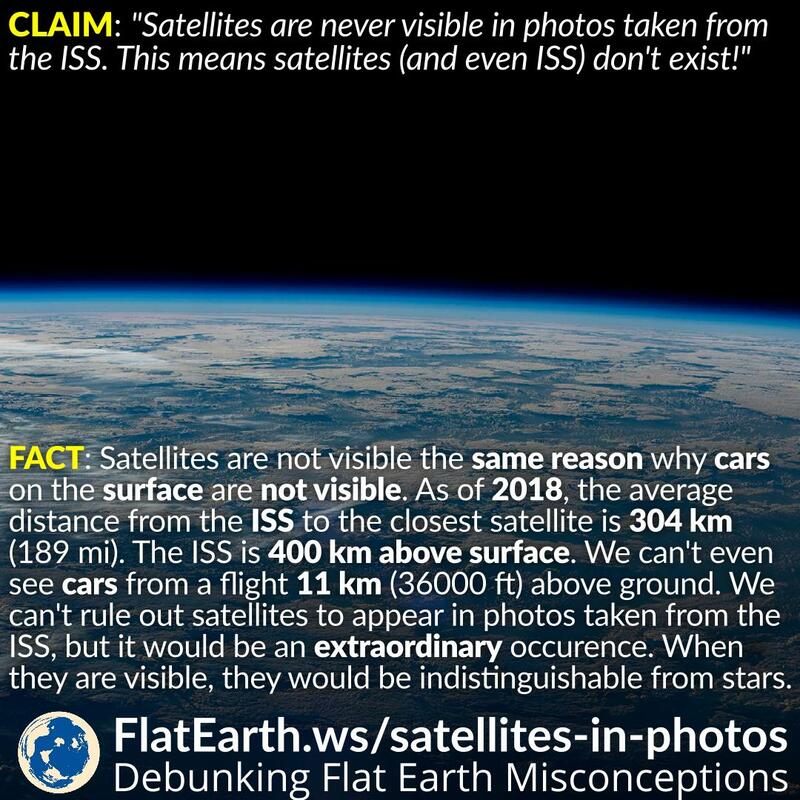 Flat-Earthers claim that satellites can never be seen, and the fact is evidence that “satellites don’t exist”. They are wrong. Satellites can easily be seen under the right conditions. Iridium is a satellite constellation consisting of 66 satellites. It provides satellite phone services over the entire Earth surface. The first generation satellites have three door-sized reflective antennas. Because of their reflectivity, Iridium satellites will occasionally reflect sunlight to Earth’s surface. The Iridium flare will look like a bright flash over a few seconds. 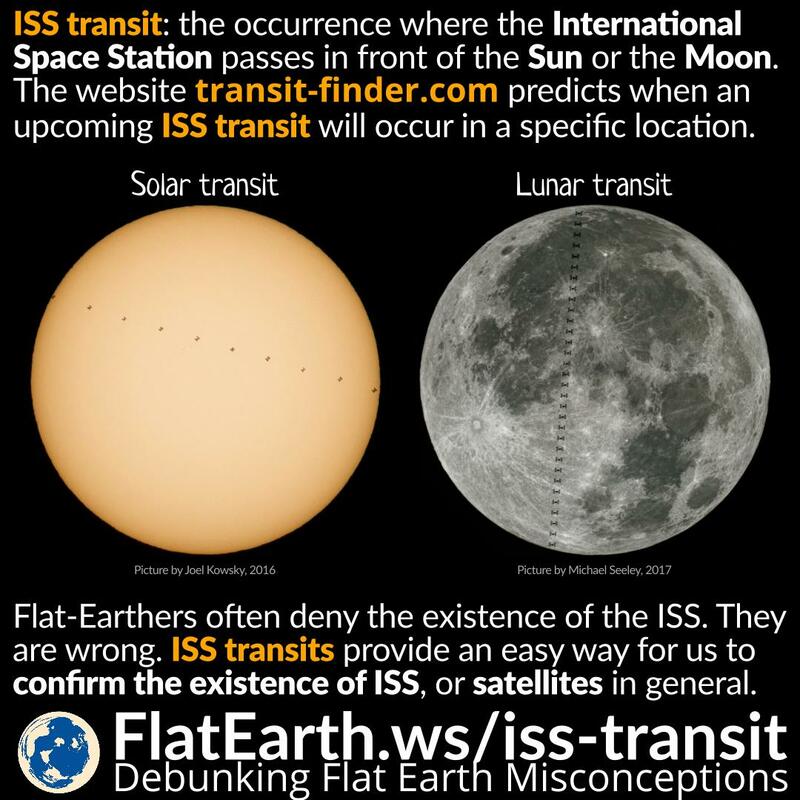 Most flat-Earthers deny the existence of satellites. 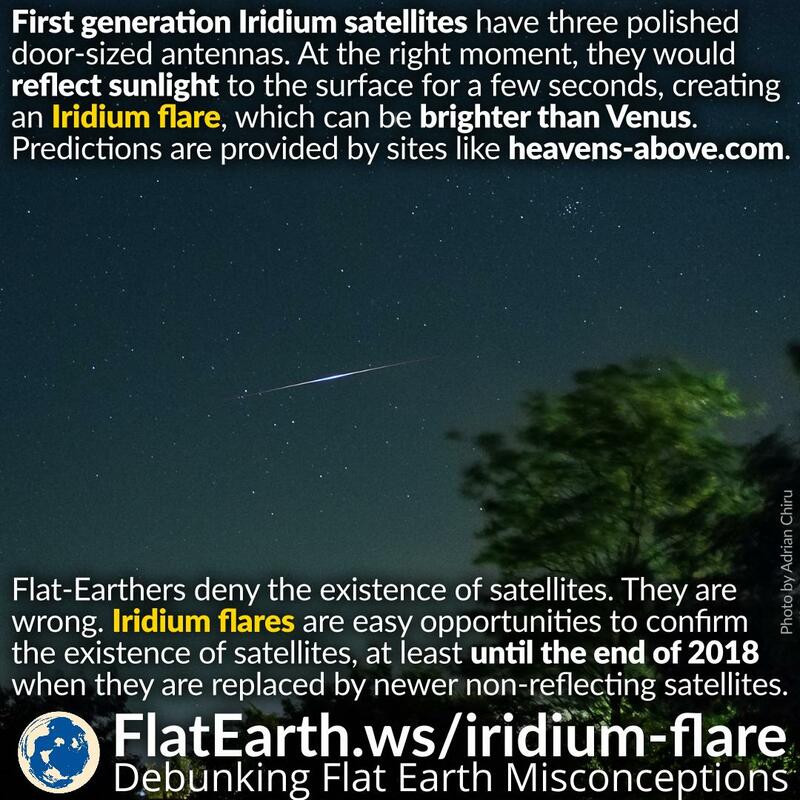 Iridium flares provide an easy opportunity to confirm the existence of satellites, at least until the end of 2018, when they are replaced by newer non-reflecting satellites. 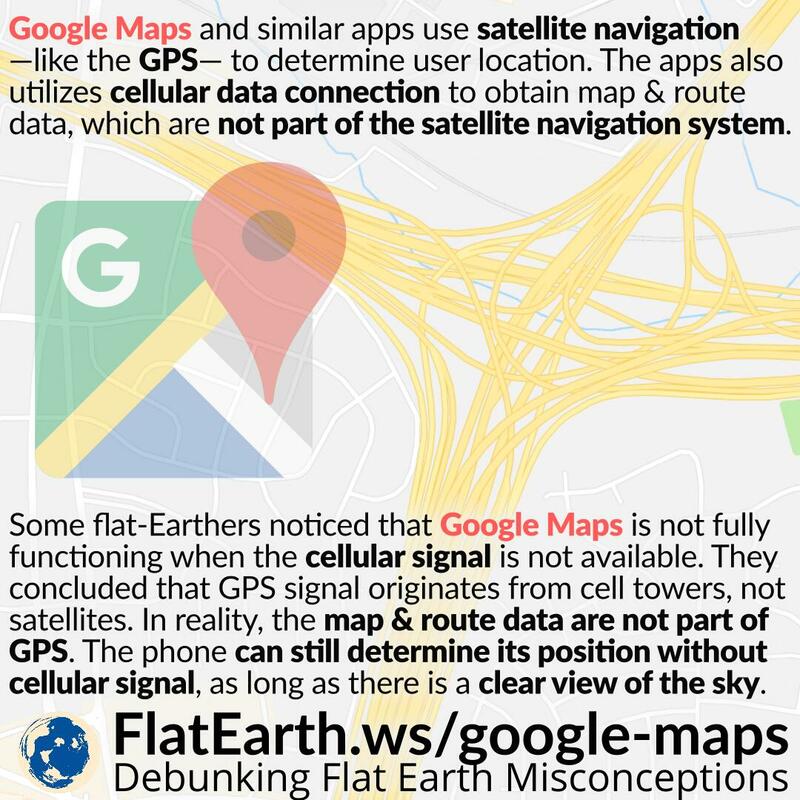 “If satellites exist, then why would mobile phone operators bother to install transceivers everywhere?” flat-Earthers asked this a lot. They are wrong. Satellites do exist, and there are good reasons why mobile phone communication utilizes cellular architecture. The GPS system is one-way. The satellites broadcast signals. GPS devices receive and process the signals to determine their location. Flat-Earthers often point out the fact we were unable to locate the ill-fated MH370 as ‘evidence’ GPS doesn’t work and therefore doesn’t exist. They are wrong. GPS satellites never receive any signal from GPS devices, and it is not possible for them to locate MH370. A human eye can only visually perceive the curvature of the Earth if we are at a considerable altitude from the surface, which is still beyond the reach of most humans today. A commercial jet airliner is the highest position realistically attainable by most humans today. 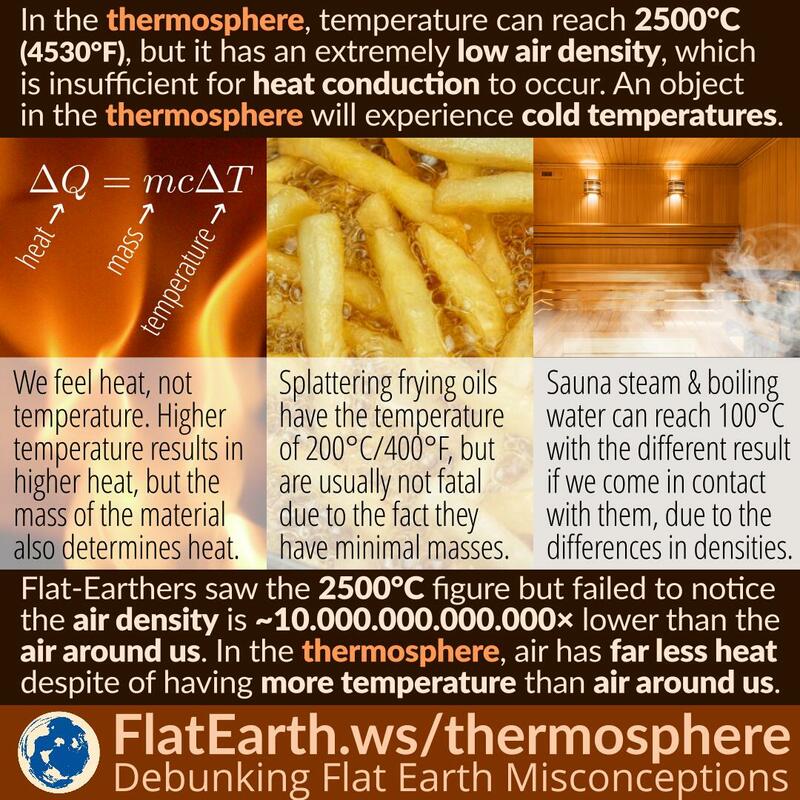 At such altitude, we can only perceive very slight curvature, and only in an ideal condition. The basis of flat-Earthers’ belief is that the horizon appears flat. They would say if we cannot see the curvature, then there’s no curvature, and thus, the Earth is flat. They are wrong. Most of us these days cannot travel high enough to see the curve. The best we can do these days is going on board a commercial jet airliner, which can only go about 11-15 km up, only a fraction of the radius of the Earth.